Click the button below to add the Carbo-Pro Case 12 Packets to your wish list. GLUTEN FREE, Contains no preservatives, color, dairy, soya, sweeteners or yeast. CARBO-PRO is a clinically tested complex carbohydrate; a Premium fuel formulated to provide simple, clean and efficient calories. 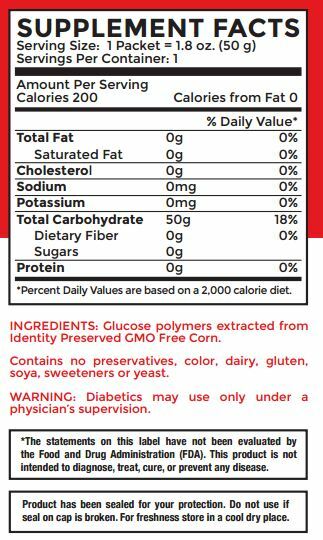 It is derived through a patented process of hydrolysis of certified Identity-Preserved (IP) CORN which has NOT been genetically modified by bioengineering technology. In order to ensure that it is IP, purchasing is done through contracts with farmers to buy corn (grown in the USA) which has not been genetically modified by bioengineering technology. Each lot is accompanied by proper IP documentation (signed certificate of handling that the Corn was IP at all times, and a signed certificate of origin listing location, producer, and seed corn brand). The corn is further tested by the ELISA (Enzyme-linked immunosorbent assay) procedure to screen for bioengineered genetic modifications. IP campaign is initiated by segregating the approved product. Finished product is tested by PCR (polymerase chain reaction) test method, which analyzes the DNA directly, by an independent laboratory to ensure integrity of the production run. PCR is recognized as being more sensitive and reliable than any other GMO test method. Each identity-preserved lot can be recognized by “IP” following the lot number. CARBOPRO is the most efficient source of hydration and energy. It offers Power, Strength and Endurance Athletes an easy and effective way to achieve the highest levels of muscle glycogen and maintain that level before, during and after activity. It replenishes muscle glycogen and helps in reducing the use of muscle protein for fuel, sparing vital muscle tissue. It mixes easily in any fluid and its neutral (non-sweet) flavor becomes convenient for consumption with any sports drink or any fluid (water, juice, shake, etc.). Allows you to determine carbohydrate intake and concentration based on intensity and duration of activity. Perfect for carbo-loading and replenishing muscle glycogen. Helps maintain hydration with LOADING because with each gram of stored muscle glycogen, the body also has to store 2.7 grams of water. The DE is <19, so has low osmolality of 200 to 220 in even up to 15% - 20% solution in water, which is lower than body fluid osmolality (280 - 300). Provides higher caloric density, as a HYPOTONIC SOLUTION, without exceeding osmotic balance and facilitates quick absorption without causing gastric distress. Easy to RE-LOAD and CARBOLOAD as needed. FOR A TWO HOUR WORKOUT/TRAINING SESSION OR COMPETITION 1. BEFORE workout or competition MIX at least Two (2) scoops in 10 - 12 oz. of cold water and drink it at least 30 minutes before workout/competition 2. DURING workout or competition, for each hour of activity MIX at least Two (2) scoops in 20 - 26 oz. of cold water (7%-10% solution) and sip throughout activity 3. AFTER workout or competition MIX at least Two (2) scoops in 10 - 12 oz. of any fluid and drink within the first hour AFTER workout/competition for optimal muscle-glycogen replenishment and recovery. You may carbo-load with Carbo-Pro for two to three days before a major event. One (1) or two (2) scoops in 12 oz. of cold water, twice a day. Once in the morning and once in the evening should be sufficient. CONDITIONING/TRAINING: Two (2) or three (3) scoops in 10 oz. to 16 oz. of cold water. Drink withinthe first hour AFTER workout. RACE/COMPETITION Carbo-Pro allows endurance athletes to adjust CARBs intake based on training or competition distance. A 150lb. athlete needs at least 300calories per hour of activity @ 2 calories per hour, per lb. of body weight. One scoop of Carbo-Pro provides 100 calories of energy. The 60 cc scoop (inside container) holds approx. 0.9 ounce (25 g) of the product. One scoop provides approx. 100 Calories. One serving size which is 2 scoops (1.8 oz./ 50 g) provides approx. 200 Calories. One serving (2 scoops/ 1.8 oz./ 50 g) represents theoretically as much carbohydrate content as 200 g (about 1/2 lb.) of cooked pasta; or as much as 430 g (about 1 lb.) of potatoes. CARBO-PRO is pure complex carbs for immediate and sustained energy is a glucose polymer, derived through a patented process that consists of D-glucose units linked primarily by alpha-1-4 bonds, having a Dextrose Equivalency of less than 16 (high molecular weight). It is a white free flowing powder prepared by hydrolysis of grains (corn/barley/rice). Its highly safe for direct human consumption. Training and carbohydrate nutrition must be designed to fit the body's fuel requirement, so that you finish every training session with the best expected performance of that session. If you are slower and weaker and out of energy towards the end of training, you will be slower and weaker and out of energy in the final, crucial minutes of competition. To grow faster and stronger you have to arrange your intake of carbs in such a way that you finish each training session with fuel to spare. Because the body needs complex carbs - to maintain peak performance. There are nutrients which are building materials and nutrients that are fuel. Proteins, vitamins, minerals, and essential fats are predominantly building materials. They are used long-term to grow a better body. All carbohydrates are essentially fuel. They are used short-term, like gas in the tank. So the types and amounts of carbs to provide the right fuel mix, and the timing of their intake to provide an optimum supply, are critical for any particular performance to succeed. Furthermore, carbs reduce the use of muscle protein for fuel, and therefore spare that vital muscle tissue. High-performance liquid chromotography analysis of CARBO-PRO determines that the average degree of polymerization, i.e., the number of glucose units joined in the molecule is 6.2. The average theoretical molecular weight is 1,000. The high molecular weight helps in quick absorption. CARBO-PRO has a perfect balance of caloric concentration and osmolality. The dextrose equivalency of CARBO-PRO is low therefore it is low in osmolality even up to 15% to 20% solution in water (200 to 220) lower than body fluid osmolality (280 to 300). For example the osmolality of sugar at 15% to 20% solution in water is approximately 800. Therefore sugar at this concentration is too hard on the stomach. Relative to sugars, CARBO-PRO provides higher caloric density without exceeding osmotic balance. In designing your carbohydrate nutrition, the primary goal should be to achieve highest level of muscle glycogen and maintain that level, before during, and after exercise/training. CARBO-PRO before, during, and after training! The easiest way to achieve correct carb nutrition is to divide carbohydrate intake into three categories: carbs before exercise, carbs during exercise, and carbs after exercise. Solid carbs (food sources) need time to digest, therefore it becomes essential to take in the first solid carbs at least 3 hours prior to exercise. If its a carbohydrate replacement drink - glucose polymers (CARBO-PRO) it should be taken at least 30-45 minutes before exercise. By doing so you would be able to raise blood glucose and improve performance. Some athletes suffer intestinal distress if they eat solid carbs (food sources) on the day of competition. If you have sensitive guts you can always safely take up to 200 grams of carbs before races in the form of a carbohydrate replacement drink (CARBO-PRO + water or juice). Habitually take at least 58 grams (2 oz.) of CARBO-PRO at least 30-45 minutes before a training session or a race. Once the exercise begins, the minimum level of carb intake required to maintain and improve performance is 40 grams (1.5 oz.) per hour. Evidence suggests that the increased blood glucose levels that result from taking complex carbs throughout exercise, permit a higher overall rate of carbohydrate use throughout. We recommend 70-90 grams per hour as optimum. To achieve that level you need to drink a bit over a quart of CARBO-PRO per hour. DO NOT USE SOLID FOODS!! They deplete your water, hydration is always your first priority. To maintain carb intake of 70-90 grams per hour during exercise, you need to drink a lot, about one 8 oz. glass every fifteen minutes. Carrying a dispenser bottle and sipping repeatedly is definitely the best way. Elite cyclists, triathletes and long distance runners often carry two or three bottles and change them frequently at aid stations. Sip a 5-10% of CARBO-PRO solution at a rate of 1 quart (35 oz.) per hour during exercise. In designing your carbohydrate nutrition, the primary goal should be to achieve the highest levels of muscle glycogen between the finish of one session of exercise and the start of the next. To do this you have to begin eating carbs immediately after you finish a session. There are excellent studies which show that muscle glycogen synthesis after exercise occurs in two phases - a very rapid rate of synthesis for about 4-6 hours (most rapid in the first 2 hours), then a much slower rate for the next 24 hours. The most rapid rate of glycogen synthesis occurs immediately after exercise because the low level of glycogen remaining in the muscles, stimulates activity of an enzyme called glycogen synthase that controls glycogen storage. Carbs have to be provided at the same time when glycogen synthase is active. The amount and type of carbs are extremely important. The maximum rate of synthesis in the first four hours after exercise occurs by feeding 112 grams (4 oz.) of CARBO-PRO in 20 oz. of water. Therefore take at least 112 grams (4 oz.) of CARBO-PRO in water immediately after exercise. Carbs are the best source of fuel providing the highest energy. An athlete always has to worry about carbs during hard training because it is difficult to get enough of it. Fat yields 9 calories per gram while carbs yield only 4 calories per gram. But the 9 calories from fat comes quite slowly. In the human body fat burns very slowly for energy. Primary fuel for exercise is adenosinetriphosphate (ATP). Its a lot easier for the body to break down muscle glycogen and blood glucose into ATP than to break down fat. Consequently, ATP is formed a lot faster from carbs than from fat. The rate of ATP synthesis from carbs is about 1.0 mol/min. From fats the rate is only 0.5 mol/min. So carbs yield twice as much energy as fats. During anaerobic activity where only carbs are used as fuel, energy formation jumps to 2.4 mol/min, almost five times the energy that can be derived from fat. se occurs in two phases - a very rapid rate of synthesis for about 4-6 hours (most rapid in the first 2 hours), then a much slower rate for the next 24 hours.